Portable, petite, and pre-packaged aren’t normally words that you think of when tea set comes to mind, but I’m here to change that for you. Remember this post about my first blogger event at Ikea? Well here is what I made with the things that I picked out and the things that I bought. I just love how this came together and what I love more is how much we’ve enjoyed using it. 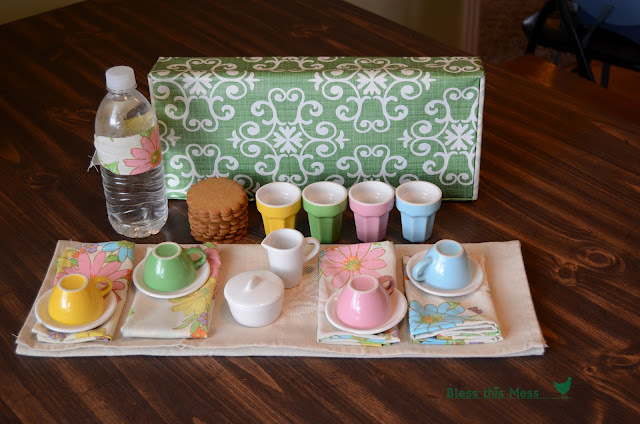 We love having tea parties and now we can take them on the go. This little set is small enough to fit in a backpack and has everything we need for an impromptu party. This would be a wonderful thing to own as a grandma or would make a perfect birthday gift too. The party doesn’t have to stay at the table anymore. You can take this little set outside on a quilt, to the park or the beach, or carry it over to the neighbor’s. I plan on taking this on the airplane next time we fly out to Kentucky to see my mom. It’s seriously the perfect size. 1. 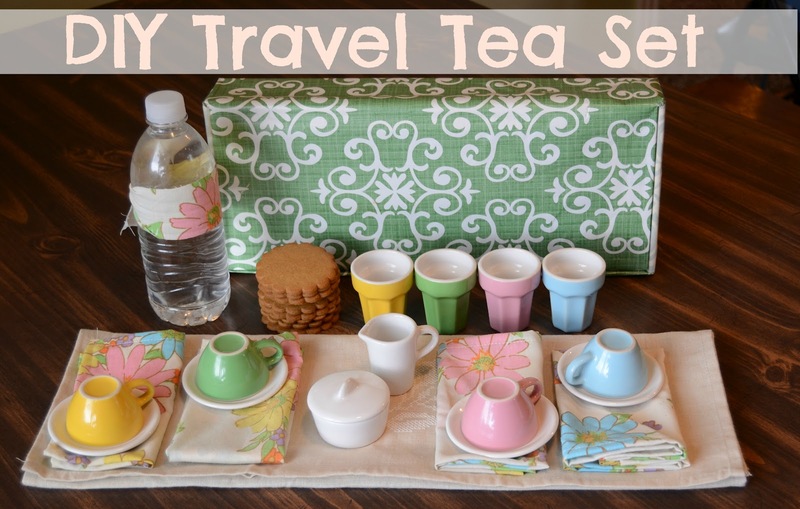 Make the traveling tea set storage box. 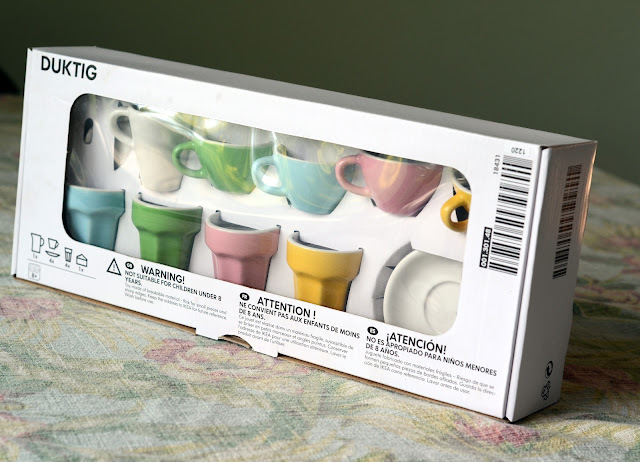 One of the things that I really liked about this little tea set was the box that it came in. I love well-thought-out packaging. 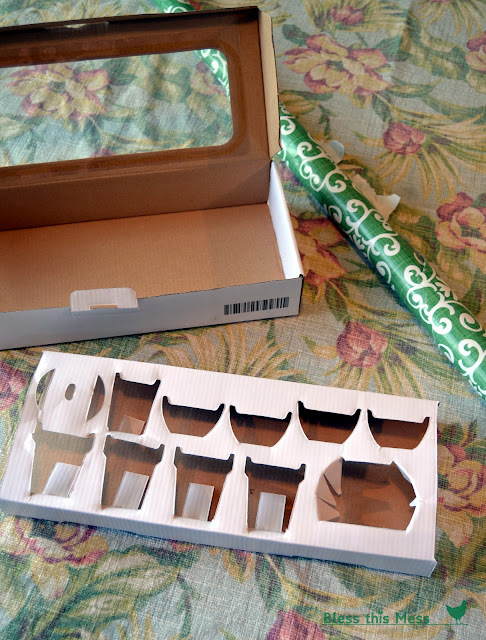 I removed the cardboard insert that held the tea set pieces and then covered the box with wrapping paper, using a glue stick to hold it on. No need to find something to store your treasure in – just use what it came with. 2. 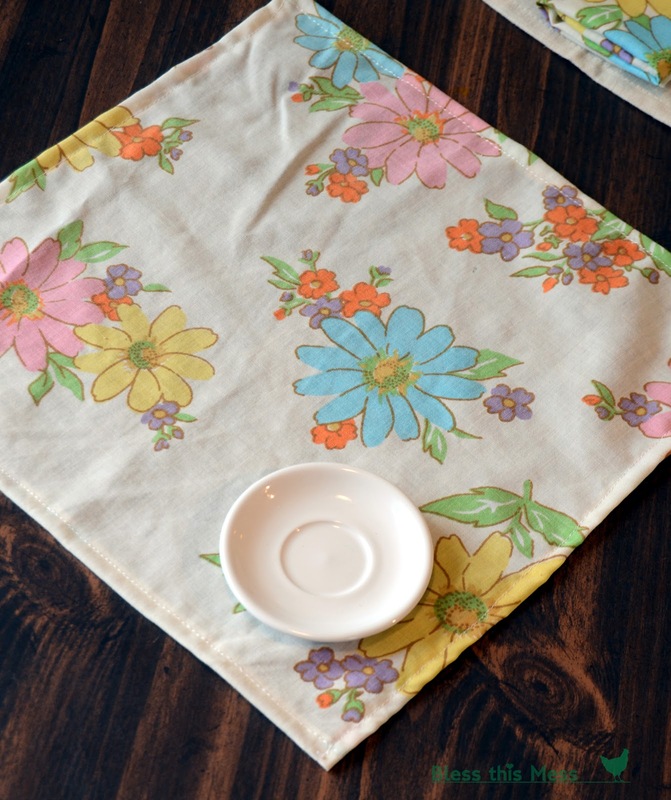 Whip up some little cloth napkins. Simply cut 4 squares from the 1/4 yard of fabric that you chose and hem the edges. I just roll the edge twice and sew, very simple really! 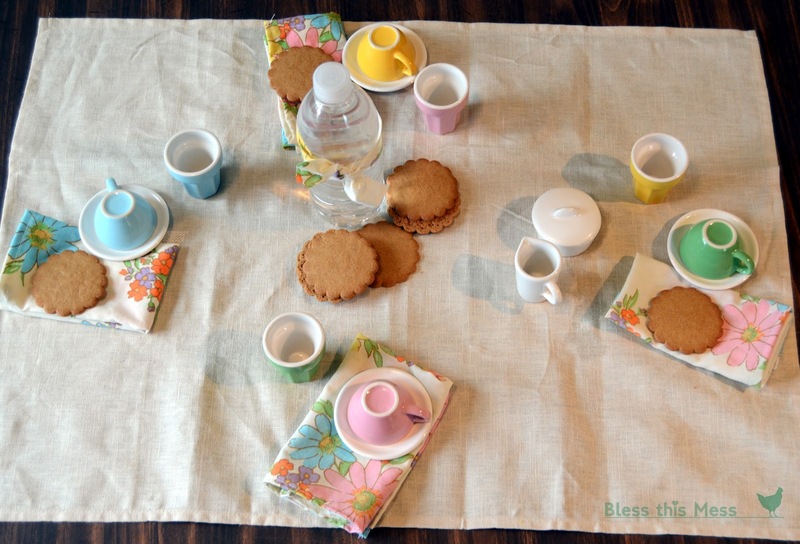 If you need a more detailed tutorial on making cloth napkins check out this post. Now, if you aren’t into sewing you could always purchase cloth napkins or use a knit or felt material that doesn’t unravel if let unhemmed. 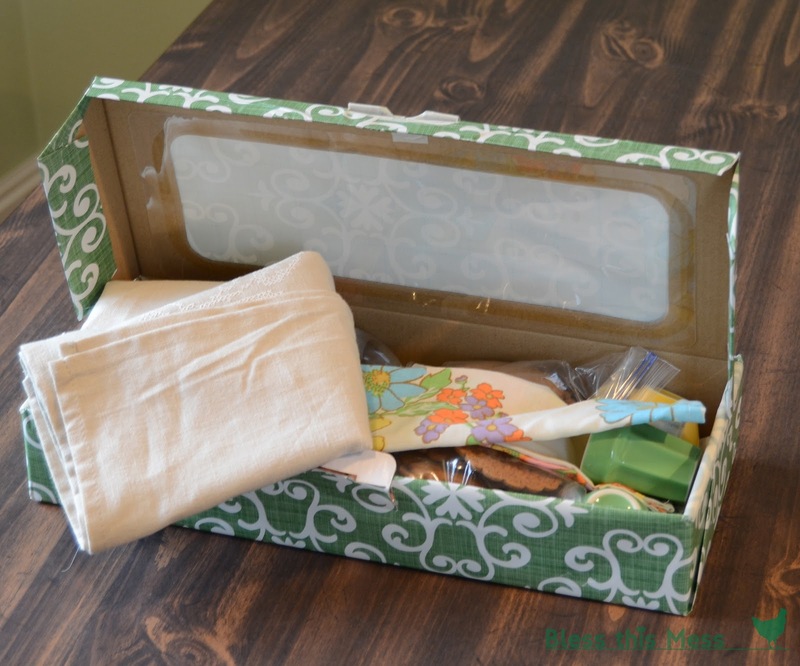 The napkins add just the right amount of homemade and elegant to the project, though. I think you should make them. 3. Add a few ginger thins to the plastic baggie. Remove the paper from a bottle of water and tie a scrap of your napkin fabric around the bottle. 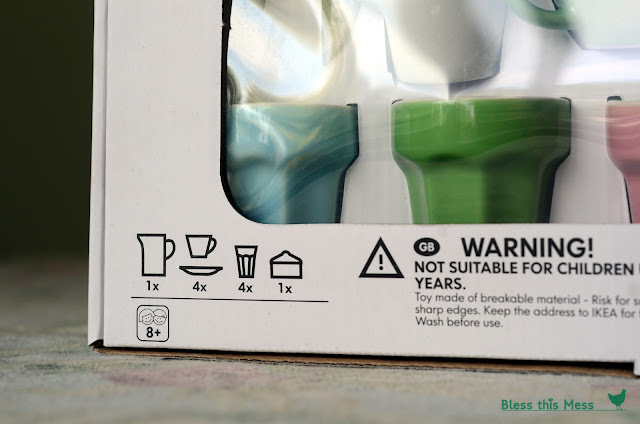 The ginger thins are a great choice for your traveling tea set because they have an excellent shelf life (my box said it was good for another 17 months past the date I bought it! ), and they don’t have any crazy ingredients. Sure they are still a treat, but they also aren’t full of artificial flavor, color, sweeteners, or preservatives. A few in the baggie are enough for a party, but remember to refill your cookie supply before you go out again. The box of ginger thins is big and you can probably have 15 parties with one box of cookies (if you can make them last that long). And don’t worry about the flavor being too strong. It is a wonderfully mild ginger that all of my kids loved. The bottled water will be the “tea.” Kids have no issues with pretending and water is basically mess-free. You are now ready to pack for your first tea party. Use the cloth napkins in between the dishes to help cushion them and keep them from hitting each other. Your tea set is all ready, and now you just need to find the perfect tea party spot. 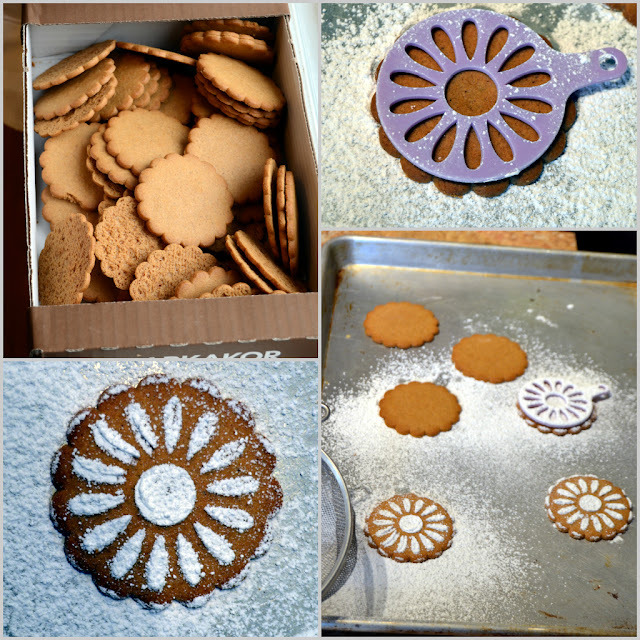 A little stencil (or a doily) and some powdered sugar on the cookies made our treat extra fancy on this particular day. I plan on making another set for my niece’s birthday (or Christmas). For a little over $15 and one hour worth of work it makes a really fun gift with just the right amount of homemade. 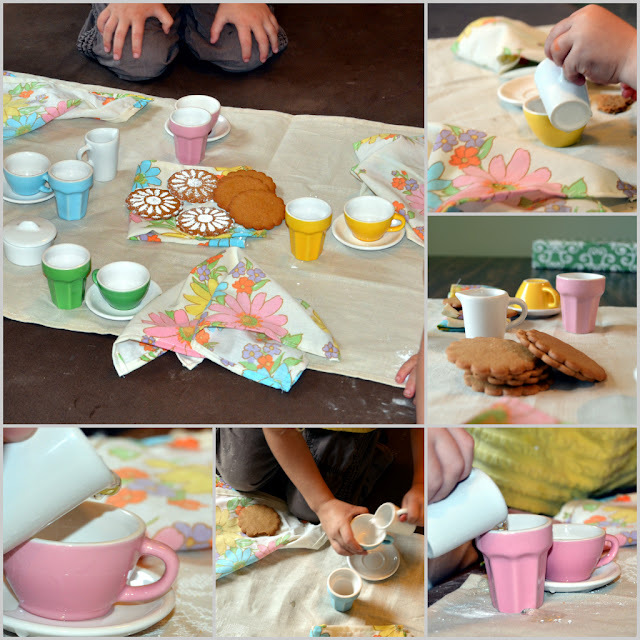 I’m also planning on making teeny-tiny fabric tea bags for our set so that the kids have a little something extra to play with. What do you think? Do you see any tea parties in your near future? Thanks for reading and have a great day. Disclosure: Just for the record, I drove 3 hours to Ikea to attend an event for bloggers. You can read a post about that day here. Ikea gave me $25 to spend at their store and a delicious free breakfast. Ikea is going to check out all of the posts from the bloggers who attended and their favorite project will score a $200 Ikea gift card for the blogger (fingers crossed!). Let’s be honest, my Ikea opinions are real and mine because I wouldn’t have driven that far (with 3 kids by myself) if I didn’t already like the store. Love! How funny I clicked this from pinterest and didn’t even know it was from you. Can I steal this for Cambrias party?!?! 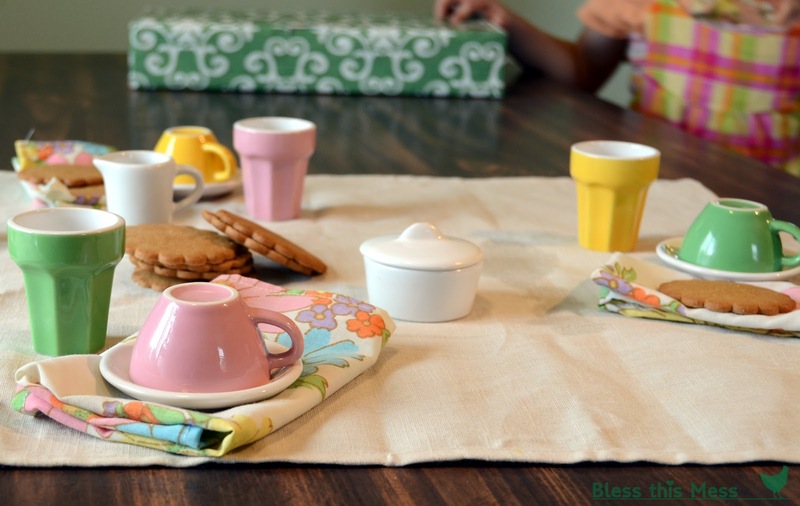 Those are beautiful fabric napkins 🙂 I love that you have random tea parties. I should do that.